To begin assessing your debt, you want to get all your debt listed in the same place so that you can see it all at once. The first step is to list all mortgage and consumer debt, including credit cards, auto loans, student loans, and any other personal debt. 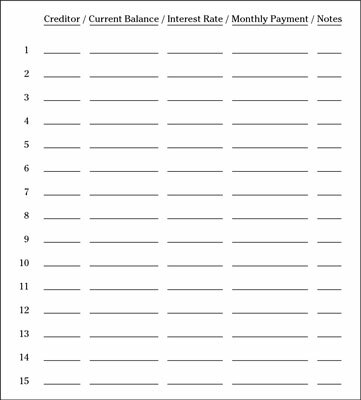 You can print and use the worksheet provided here to list your current debt situation. If you have a copy of your current combined credit report in hand, the Consumer Debt Accounts worksheet is easy to complete. If you don’t, you’ll need to pull copies of all your credit-card and loan statements to obtain this information. You should get a copy of your credit report each year. It’s easy. If you haven’t obtained one this year, you can get a free copy of your credit report online. 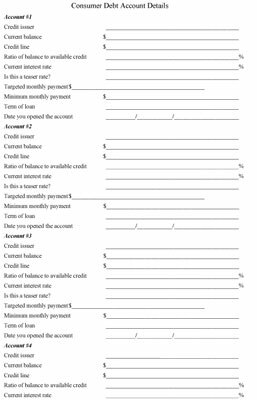 Click here to download and print the Consumer Debt Accounts worksheet. Add up the total of your required monthly debt service payments and divide that amount by your monthly gross income. The result is your back-end ratio, which should be no more than 36%. Click here to download and print the Consumer Debt Accounts Details worksheet. If you currently have a teaser rate, expect that at some point in the near future the current interest rate will be drastically higher. When determining the term of your loan, you want to check whether you have a fixed or variable rate, a balloon payment, or loans amortized over a period of time (30 years, 5 years, and so on).